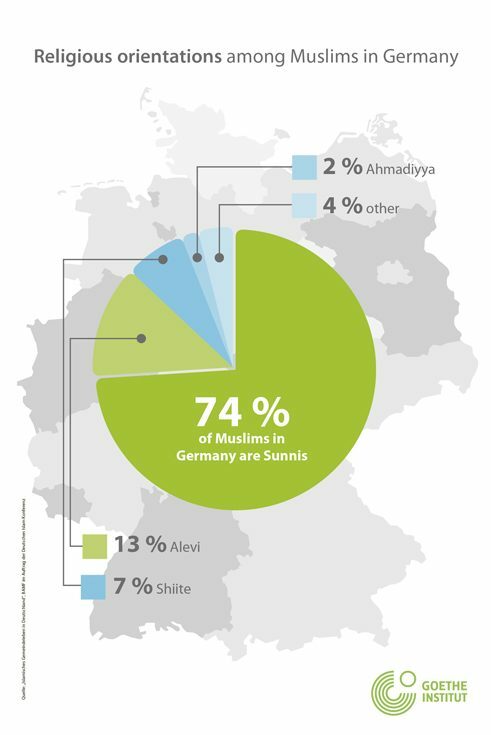 ​Germany is home to around 4.5 million Muslims. The major associations are theologically conservative, yet the Islamic community is becoming ever more diverse. 16 June 2017 was an important day for women’s rights campaigner Seyran Ateş and for Islam in Germany. Dressed entirely in white, she held her first Friday prayers and thus opened the Ibn Rushd-Goethe Mosque she founded in Berlin. Twenty television teams from all over the world covered the ceremony. After all, the new, liberal community at this mosque not only allows women to preach, but also allows them to pray unveiled and together with the men in one room. Previously, this had only ever been seen in the USA and Great Britain. The opening of the small, liberal mosque also became a major media event because the majority of the approximately 4.5 million Muslims in Germany are conservative in terms of liturgy and ritual. Indeed the four large Islamic umbrella organizations are likewise all theologically conservative. Yet no one knows exactly how many of the Muslims in Germany are actually religious and practice their beliefs. The associations and mosques do not keep lists of members, and the authorities do not keep records of mosques, either. The German Islam Conference gives the number of Muslim prayer halls as 2,600, of which around 150 are “classic” mosques, i.e. buildings with a dome and generally also a minaret. With 900 mosque communities, the Turkish-Islamic Union for Religious Affairs (Ditib) is the largest association of mosques in Germany. It is governed by the Ankara religious authority and preaches a religiously conservative Islam. After all, the first Muslims to come to Germany in large numbers were the so-called Gastarbeiter (meaning “guest workers”) from Turkey, who started to arrive in the 1960s. Many came from rural parts of Anatolia, where the population followed a traditional, primarily Sunni Islam. They and their children and grandchildren still make up a good half of all Muslims in Germany. During the 1980s refugees arrived from the Arab states fleeing civil war there, to be followed in the 1990s by many Bosnians. More than half of the approximately 900,000 people who came to Germany in 2015 seeking protection from war and persecution came from Syria, Afghanistan, Iraq, Iran and Eritrea. For many back in the first generation of immigrants, religion represented a substitute for their home country and played an important social role: People met up, talked about their everyday difficulties, organized weddings and arranged neighbourhood assistance. Since it needed to be cheap, the believers gathered in backyards, in disused parts of factories, and in empty supermarkets and cellars. Around 20 years ago, the first communities began to build typical mosques and to demonstrate their beliefs confidently in public. After all, piety increased with the generations of children and grandchildren of the immigrants, as revealed by the “Religionsmonitor 2017”, compiled by the Bertelsmann Foundation. Germany is a secular country. State and religion are separate, and the state does not interfere in the intrinsic matters of the religions. At the same time, it is positively disposed towards the religious communities and cooperates with them in many areas, such as welfare work or religious education in state schools. Eleven of the 16 federal states now educate children about Islam as well as Christianity, and the first institutes of Islamic theology have been founded by universities. Half of all Muslims in Germany have a German passport, and according to the Religionsmonitor 2017, 81 percent are in full-time or part-time employment and three quarters mix with non-Muslims in their free time. In short: Muslims in Germany are pretty well integrated. Nevertheless there are tensions with non-Muslims. Controversy surrounds almost every prestigious new mosque development, and the wearing of headscarves and veils by Muslim women is a source of recurring debates. Aside from the sometimes loud political debates, many Muslims practice their beliefs unobtrusively and away from the mosques. They fast during Ramadan, but still buy a tree at Christmas because their children want to enjoy Christmas in the same way most people around them celebrate it. Others see Islam primarily as a cultural matter that binds even third-generation immigrants to their old homeland. German society and even the Islamic community are becoming ever more colourful, and among the younger generation there is a growing willingness to see this as a given. Bit by bit, Muslims in Germany are becoming German Muslims. Claudia Keller has been editor of the magazine “Herder Korrespondenz” since 2017. Previously she wrote about the themes of church and religion for “Tagesspiegel”.